Absolutely a huge issue. As I’ve pointed out a number of times, this inner-north-west area places in stark relief the irrational apartheid that still exists between tram planning and bus planning. If you compare the bus frequencies above with the frequencies of the north-south tram routes, you soon enough find that the *least* frequent tram is still more frequent than the most frequent bus. Those east-west buses across Moonee Valley, Moreland and Darebin could actually provide a really good network in conjunction with the north-south trams, but the low frequencies kill it currently. As the author of ‘FightForSmartBus.info’ I absolutely support the introduction of many new SmartBus routes, including the 904. The only difference in on-bus technology between a SmartBus and all other suburban buses, is the inside PIDS which shows the name of the next stop. I would suggest that all buses be upgraded with all buses getting that internal PIDS as that, and have all the bus units themselves operate across all bus routes, and all buses with the one same logo/livery. My understanding is that the 904 is to replace the 246 between Clifton Hill and Elsternwick, and at one stage it was meant to replace the 600 south from Brighton. Also, I have been recently informed that the 904 may never happen. We need to start a combined pressure on those in power, to say ‘it is now time for the 904’. Don`t forget the western section of the 903 has not been implemented. That needs to happen asap as well. Electrifying the Melton line would be useful for that section as well as it passes Deer Park. How well it would connect to Watergardens/Sydneham station needs to be asked as well. This is precisely the topic I want to write my thesis on next year. Glad to hear PTV are currently working on the problem, it seems like the implementation of PTV is actually bringing some results, despite not being the optimal solution many of us had lobbied for. From what I can tell, the 904 would’ve taken the 506, not the 508 route from Clifton Hill heading west. Sounds like PTV is largely basing its concepts on the Walker-inspired Canberra bus network reforms of recent years. They have the benefit of both improving day-to-day operation and outlining longer term planning/urban design around which corridors will get frequent/direct, and which will stay as coverage, too. Better faster streets for buses, yet the bus route has been stolen from you local street. It is a hard call. Daniel, the 901 bus doesn’t go down Mickleham Rd as shown in your map. It goes down Pascoe Vale Rd. @Andrew – I don’t think losing the bus from your street is a hard call if another 1-200m away there’s a direct bus, with good connections, that arrives at double or quadruple the frequency of the meandering local. If the local bus is being removed without replacement, then not so good. In reference to buses disappearing from local streets, couldn’t we move all of the full-size buses to the main roads and just add smaller buses to the local streets? The smaller buses, which fit better in local streets, could then do the job of collecting people from all of those streets and ferrying them to/from a few of the bus stops on the main roads, where they can be picked up/get off the larger buses doing the longer runs. @Andrew – If the choice is between a service that arrives irregularly (say ever 43 minutes) and infrequently and takes a long time to travel to any given destination and a service that operates regularly and frequently and travels directly and quickly, I’m sure you’ll find that in the vast majority of scenarios you’ll be better off with the latter regardless of whether the bus stop is outside your house or 500m away, around the corner. @Philip – Small buses offer bus operators only marginal savings. In a first world country the largest component of a bus operators cost is in driver wages, (this is especially true in Australia where wages are very high). Smaller buses therefore offer only marginal savings, whilst sacrificing considerable flexibility (a big bus can carry 2 passengers easily, but a small bus can’t carry 80 passengers). Hopefully we get see some changes for routes Trsnsdev runs, there is lot of potential. With certain routes or sections that can be cut and buses reused where need. Cutting 216/219 south elsternwick is example of one thing could cut. The recommendation for the Eddington Report for the Doncaster line was to the run the buses out to that suburb on a “tram like frequency”. Coming home from Oakleigh in the evening I have used the 900 bus a few times and would have used it more if it went more than once every 30 minutes. It runs straight to Caulfield Station via Chadstone Shopping Centre and is usually fairly empty. Going out to the zone 2 suburbs you are more likely to get a bus also. 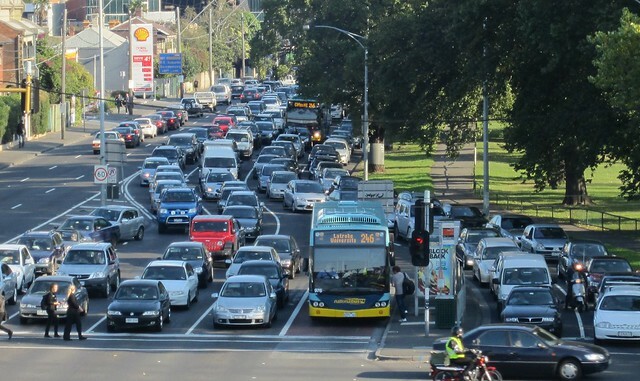 The I get the most regularly in the inner city is the 246 bus up Punt Rd if I am going to Johnston St or Northcote from home as you cut out a trip to the CBD, which can be not pleasant on weekends at night. My personal view is that the blue orbital should be introduced but after Elsternwick, it should continue via Rusden Street and Nepean Highway to Mentone. Nepean Highway is a missing link in the public transport network despite being part of the PPTN (if they still have the PPTN that is). It would link up quite a few other routes and serve Southland.